Dunne Music Company proudly represents the Allen Organ Company, Bose Professional Audio, and Roland Classic products. The Allen Organ Company has long been the world's largest builder of church and theatre organs. Our list of customers represent nearly 2000 Allen Organ products in Florida, Georgia, The Bahamas, Caribbean and Central America. 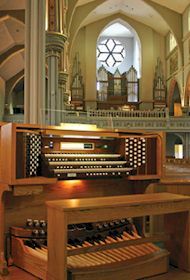 Dunne Music Company carries the entire line of Allen Organs including Historique™, Chancel™, Bravura™, and Theatre Organs. In addition, we offer specialized training in the use and incorporation of GeniSys™ voices, by Allen. We are excited to be providing a wide range of MIDI Products through Allen as well, including the Allen Vista Navigator™, the Allen Ensemble™, and the MIDI Assistant™. Add to all of the the various custom audio options such as the Allen Portatif™, EAC™, and Interlaced Audio™ and you have a full line up from the world's largest builder of organs. Because of their growing popularity, the demand for digital/pipe combinations has increased in recent years. Our digital/pipe installations range from all new consoles and pipe work, to adding new consoles and digital voices to existing pipe work. Dunne Music Company has installed digital/pipe combinations in both residences and churches. We have experienced pipe organ technicians on staff. The advantages our digital/pipe customers have are working with local people whom they know and trust, and the peace of mind from knowing their pipe organ technicians are based locally, not out-of-state (or country). Since the introduction of the Renaissance™ series, sales worldwide have boosted to new levels. Now with Quantum™ technology and the Elite™ Organs, Allen Organs are equaled by no one else. Allen Organs are made in this country, under the supervision of the same Pennsylvania family that founded the company in 1938. It is indeed an honor for us at Dunne Music Company to be representatives of the Allen Organ Company. We love what we do. And, with the products and technology available to us from the builders of the world’s first digital organ, we’ll be doing it well into the next millennium. In addition, Dunne Music Company now offers a variety of Roland digital products. This combination of classic and contemporary instruments is perfect for use in the "blended" or "praise" style worship. Recently we were awarded the sole distributorship of Bose Professional Products for Houses of Worship in South Florida. The Bose Professional Product line includes the revolutionary MA12 line array speaker system, a speaker that is compact, and distributes sound in tight, controlled patterns, making the MA12 ideal for reverberant churches. It is no longer necessary to treat the acoustics of a church with sound deadening materials to obtain clear, concise spoken word sound in a cathedral environment. The legendary Bose 802 speakers, the 502's and the standard 402's, along with a full complement of compact subwoofers are now a part of the Dunne Music offerings. We continue to design sound reinforcement systems individually, customizing each digitally driven system for the particular requirements of each client.